WestJet airlines set up a Santa booth at two boarding gates where passengers scan their boarding cards and Santa asks them what theya��d like for Christmas. Some dream big with Android tablets and televisions while some ask for socks and scarves. And then the flight takes off. The real surprise is when each of the passengersa�� wishlist is packed, addressed and signed by Santa and shows up on the carousal of the destination airport. The video is called the WestJet Christmas Miracle. It innocently began when Mike Grey was born in 1980 and proves that some people never tire of sitting on Santaa��s lap. 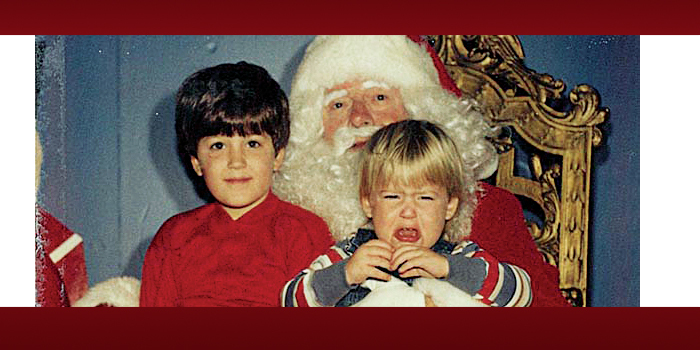 Year after year, Mike and Martin, his brother, made sure a photo was taken with Santa Claus. 34 years later, the torch has been passed onto a new generation of kids a�� two of Mikea��s and one of Martina��s. a�?This will be their problem to deal with,a�? Martin jokes, adding, a�?Mom thinks ita��s hysterical, and ita��s all about making mom happy.a�? The Holderness family takes the annual newsletter to a whole new level with this funny, cute yet over the top video. The whole family stars in the film in their a�?Christmas jammiesa�� as they rap 2013 updates about themselves to Will Smitha��s Miami. Their enthusiasm is infectious though and most people who watch the video appear to want to be part of the musical and share in the quirky, and even slightly crazy, Christmas fun.